Sheldon’s Porta-Plant Study Center is an illuminated, time controlled unit that makes a variety of plant growth projects possible. Classroom management and cleaning time are minimized as the tote trays and mobility of this unit are utilized. 56″ L. X 28″ W. X 71″ H.
Solid hardwood ends are drilled to allow adjustable positioning of the shelves, and are secured to steel pedestal feet fitted with wide, swivel-type casters. Two plant shelves are equipped with seven removable plastic growing trays each. 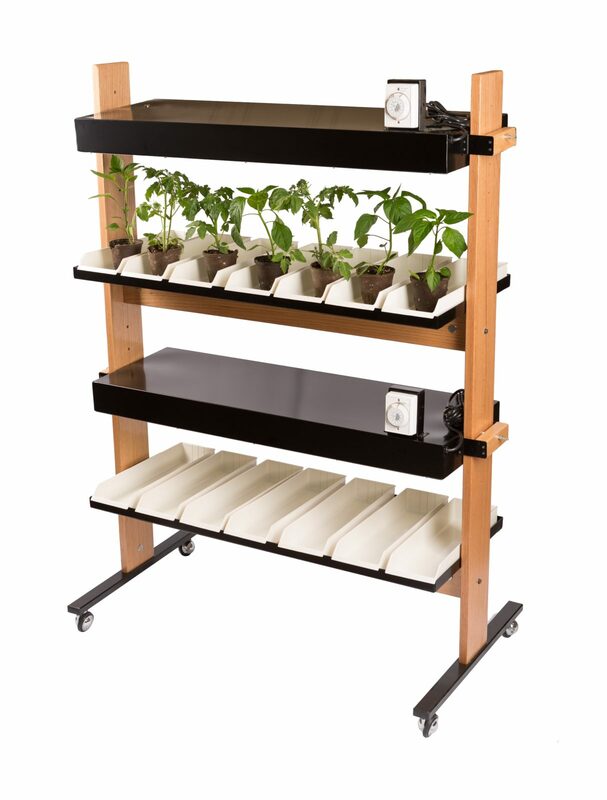 Each shelf contains four 40-watt Gro-lux lamps and has a photo-period programming timer adjustable through a full 24-hour period. One project book with instructional material for instructor and students is included with at least 28 projects that are detailed for laboratory use.